Our mulch is a natural product and the color, texture, etc. will change throughout the season and between different batches. The pictures on our website are representations only and we do not guarantee that your mulch will exactly match the texture and color of these pictures. If this may be an issue we recommend the customer visit our yard to view samples prior to placing an order. It is also important that customer orders the mulch they require all in one order as mulch delivered in different batches may vary in texture, color, etc. Customer agrees to accept the mulch "as is" and understands there will be no refunds, exchanges, etc. for disputes based upon mulch color, texture, etc. If delivery requires our truck driving inside the curb, customer agrees to hold The Mulch Store harmless for any damage including but not limited to sidewalks, driveways, buildings, trees, lawns, sprinkle heads, etc. Our driver is authorized to use their best judgement upon where he/she can safely deliver your mulch. Overhead wires, tree branches, etc. may prevent the driver from delivering your mulch exactly where you desire. Also, our drivers are not allowed to drive off the pavement for any reasons. Customer agrees that there will be no reduction in price or refunds of any kind if the mulch must be delivered to a location other than where customer originally requested. We do NOT deliver quantities of less than 4 yards of mulch. Thus we recommend that all customers measure their landscape beds and then utilize the "Mulch Calculator" on our website to have the correct amount of mulch delivered. We also recommend all customers error on the side of ordering one additional yard of mulch rather than ending up a yard of mulch short. Coupons are valid online only. They must be used at time of purchase and will not be refunded nor will any adjustments in price be made once the order has been processed. If for any reason you believe that you did not receive the full amount of yards of mulch that you ordered, you must notify us prior to spreading any of the mulch. There is an easy way to verify the amount of mulch that was delivered, but you will need to measure the amount of mulch while you spread it. It is agreed that there will be no adjustments to the total price or any additional product delivered if the customer has already spread the mulch on his/her landscape beds prior to notifying us. Our mulch calculator computes based on measurements inputed by the customer. Customer agrees to hold The Mulch Store harmless for inaccurate measurement inputs that result in the improper calculation of mulch required. Additional deliveries required due to inaccurate calculations are subject to the full delivery charge and product price. Changes to orders are subject to a $35.00 change order fee. There are absolutely no changes allowed to orders after 12 noon on the day prior to when your mulch is scheduled to be delivered. If an order is cancelled outright after 12 noon on the day before the day your mulch is scheduled to be delivered, it is agreed there will be a $50.00 restocking fee that will be deducted from any refund. All sales are final! Once the Mulch has been delivered you may not request a refund for any reason. 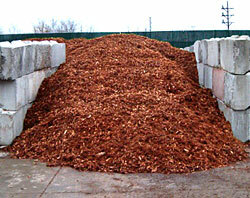 The Mulch Store will not pick up excess mulch nor will The Mulch Store exchange mulch delivered for another product.